Baby names. What’s your story? Kids Bloom – Parenting Advice – all about your baby, toddler, child & you! Shortly after discovering I was pregnant I started thinking about baby names. I did what I believe most new parents do and Googled it! I couldn’t believe the results. Popular baby names, unique baby names, trending baby names, even “geeky” or “emo” baby names! Basically, you name it and I’m sure at some point I came across it. Much like everything in life, sometimes the best names just come to you randomly when you aren’t searching for it. One day my SO said “What about Scarlett?” It brought an immediate smile to my face. 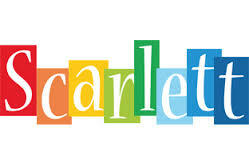 Scarlett… I love it! My father, who passed away in 2013, had the beautiful Italian last name “Scarlata” and in honor of him we decided to name our beautiful baby girl Scarlett. We also agreed on her middle name “Cecilia.” Not only was my father from Cecily, Scarlett’s great grandmothers name was also Cecilia. We were happy to have a meaning behind her name and to this day, I’m still proud when I tell about it. Have you decided on your baby’s name yet? What’s the meaning behind your baby’s name? If you have any children, how did you come up with their name? If you’re still on the hunt for the perfect baby name, try The Baby Name Wizard. What a beautiful story and history!! Love that name! It has such confidence! I named my son “Liam” and loved that it exuded such calm, serene consonants like the “m” at the end. I wanted a name that ensured my son would have a Disneyland keychain or other travel souvenir nameplate opportunity, which I never had! Thanks for sharing this post! Great story. My daughter is named after my guardian angel, a friend who passed away after college. That’s awesome. What is her name? Next Next post: Taking the good with the bad, being a Stay at Home Mom.